Contemporary British artist Maria Rivans creates surrealist collage art. 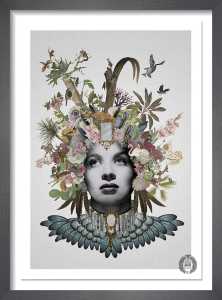 Maria's botanical-style portraits take inspiration from popular music, film, art and fashion. Her detailed and colourful style evokes a dreamy world of exploding vintage ephemera.